For other uses, see Murray River (disambiguation). The Murray River (or River Murray[n 1]) (Ngarrindjeri: Millewa, Yorta Yorta: Tongala) is Australia's longest river, at 2,508 kilometres (1,558 mi) in length. The Murray rises in the Australian Alps, draining the western side of Australia's highest mountains, and then meanders across Australia's inland plains, forming the border between the states of New South Wales and Victoria as it flows to the northwest into South Australia. It turns south at Morgan for its final 315 kilometres (196 mi), reaching the ocean at Lake Alexandrina. The water of the Murray flows through several terminal lakes that fluctuate in salinity (and were often fresh until recent decades) including Lake Alexandrina and The Coorong before emptying through the Murray Mouth into the southeastern portion of the Indian Ocean, often referenced on Australian maps as the Southern Ocean, near Goolwa. Despite discharging considerable volumes of water at times, particularly before the advent of largescale river regulation, the mouth has always been comparatively small and shallow. 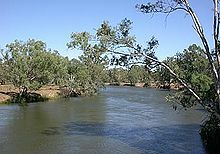 As of 2010, the Murray River system receives 58 percent of its natural flow. It is perhaps Australia's most important irrigated region, and it is widely known as the food bowl of the nation. The Murray River forms part of the 3,750 km (2,330 mi) long combined Murray–Darling river system which drains most of inland Victoria, New South Wales, and southern Queensland. Overall the catchment area is one seventh of Australia's total land mass. The Murray carries only a small fraction of the water of comparably-sized rivers in other parts of the world, and with a great annual variability of its flow. In its natural state it has even been known to dry up completely during extreme droughts, although that is extremely rare, with only two or three instances of this occurring since official record keeping began. The Murray River makes up most of the border between the Australian states of Victoria and New South Wales. Where it does, the border is the top of the bank of the Victorian side of the river (i.e., none of the river itself is actually in Victoria). This was determined in a 1980 ruling by the High Court of Australia, which settled the question as to which state had jurisdiction in the unlawful death of a man who was fishing by the river's edge on the Victorian side of the river. This boundary definition can be ambiguous, since the river changes its course over time, and some of the river banks have been modified. West of the line of longitude 141°E, the river continues as the border between Victoria and South Australia for approximately 11 km (6.8 mi), where this is the only stretch where a state border runs down the middle of the river. This was due to a miscalculation during the 1840s, when the border was originally surveyed. Past this point, the Murray River is entirely within the state of South Australia. Between 2.5 and 0.5 million years ago the Murray River terminated in a vast freshwater lake called Lake Bungunnia. Lake Bungunnia was formed by earth movements that blocked the Murray River near Swan Reach during this period. At its maximum extent Lake Bungunnia covered 33,000 km2 (12,741 sq mi), extending to near the Menindee Lakes in the north and to near Boundary Bend on the Murray in the south. The draining of Lake Bungunnia occurred approximately 600,000 years ago. Deep clays deposited by the lake are evident in cliffs around Chowilla in South Australia. Considerably higher rainfall would have been required to keep such a lake full; the draining of Lake Bungunnia appears to mark the end of a wet phase in the history of the Murray-Darling Basin and the onset of widespread arid conditions similar to today. A species of Neoceratodus lungfish existed in Lake Bungunnia (McKay & Eastburn, 1990); today Neoceratodus lungfish are only found in several Queensland rivers. The noted Barmah River Red Gum Forests owe their existence to the Cadell Fault. About 25,000 years ago, displacement occurred along the Cadell fault, raising the eastern edge of the fault, which runs north-south, 8 to 12 m (26 to 39 ft) above the floodplain. This created a complex series of events. A section of the original Murray River channel immediately behind the fault was abandoned, and it exists today as an empty channel known as Green Gully. The Goulburn River was dammed by the southern end of the fault to create a natural lake. The Murray River flowed to the north around the Cadell Fault, creating the channel of the Edward River which exists today and through which much of the Murray River's waters still flow. Then the natural dam on the Goulburn River failed, the lake drained, and the Murray River avulsed to the south and started to flow through the smaller Goulburn River channel, creating "The Barmah Choke" and "The Narrows" (where the river channel is unusually narrow), before entering into the proper Murray River channel again. This complex series of events, however, diverts attention from the primary result of the Cadell Fault — that the west-flowing water of the Murray River strikes the north-south fault and diverts both north and south around the fault in the two main channels (Edward and ancestral Goulburn) as well as a fan of small streams, and regularly floods a large amount of low-lying country in the area. These conditions are perfect for River Red Gums, which rapidly formed forests in the area. Thus the displacement of the Cadell Fault 25,000 BP led directly to the formation of the famous Barmah River Red Gum Forests. The Barmah Choke and The Narrows mean the amount of water that can travel down this part of the Murray River is restricted. In times of flood and high irrigation flows the majority of the water, in addition to flooding the Red Gum forests, actually travels through the Edward River channel. The Murray River has not had enough flow power to naturally enlarge The Barmah Choke and The Narrows to increase the amount of water they can carry. The Cadell Fault is quite noticeable as a continuous, low, earthen embankment as one drives into Barmah from the west, although to the untrained eye it may appear man-made. Being one of the major river systems on one of the driest continents on Earth, the Murray has significant cultural relevance to Aboriginal Australians. According to the peoples of Lake Alexandrina, the Murray was created by the tracks of the Great Ancestor, Ngurunderi, as he pursued Pondi, the Murray Cod. The chase originated in the interior of New South Wales. Ngurunderi pursued the fish (who, like many totem animals in Aboriginal myths, is often portrayed as a man) on rafts (or lala) made from red gums and continually launched spears at his target. But Pondi was a wily prey and carved a weaving path, carving out the river's various tributaries. Ngurunderi was forced to beach his rafts, and often create new ones as he changed from reach to reach of the river. At Kobathatang, Ngurunderi finally got lucky, and struck Pondi in the tail with a spear. However, the shock to the fish was so great it launched him forward in a straight line to a place called Peindjalang, near Tailem Bend. Eager to rectify his failure to catch his prey, the hunter and his two wives (sometimes the escaped sibling wives of Waku and Kanu) hurried on, and took positions high on the cliff on which Tailem Bend now stands. They sprung an ambush on Pondi only to fail again. Ngurunderi set off in pursuit again, but lost his prey as Pondi dived into Lake Alexandrina. Ngurunderi and his women settled on the shore, only to suffer bad luck with fishing, being plagued by a water fiend known as Muldjewangk. They later moved to a more suitable spot at the site of present-day Ashville. The twin summits of Mount Misery are supposed to be the remnants of his rafts, they are known as Lalangengall or the two watercraft. Remarkably, this story of a hunter pursuing a Murray cod that carved out the Murray persists in numerous forms in various language groups that inhabit the enormous area spanned by the Murray system. The Wotojobaluk people of Victoria tell of Totyerguil from the area now known as Swan Hill who ran out of spears while chasing Otchtout the cod. For millennia, Aboriginal people have lived along the river. Indigenous groups included Ingalta, Moorundie, Goodwarra, Parrian-kaperre, Tongwillum, and Yoorlooarra. In the Riverland (South Australia), the Ngarrindjeri people lived on and along the lands around the Murray and the Coorong and are, today, the largest Aboriginal community in South Australia. The first Europeans to encounter the river were Hamilton Hume and William Hovell, who crossed the river where Albury now stands in 1824: Hume named it the Hume River after his father. In 1830 Captain Charles Sturt reached the river after travelling down its tributary the Murrumbidgee River and named it the Murray River in honour of the then British Secretary of State for War and the Colonies, Sir George Murray, not realising it was the same river that Hume and Hovell had encountered further upstream. Sturt continued down the remaining length of the Murray to finally reach Lake Alexandrina and the river's mouth. The area of the Murray Mouth was explored more thoroughly by Captain Collet Barker in 1831. In 1852 Francis Cadell, in preparation for the launch of his steamer service, explored the river in a canvas boat, travelling 1,300 miles (2,100 km) downstream from Swan Hill. In 1858 the Government Zoologist, William Blandowski, along with Gerard Krefft, explored the lower reaches of the Murray and Darling rivers, compiling a list of birds and mammals. Small-scale pumping plants began drawing water from the Murray in the 1850s and the first high-volume plant was constructed at Mildura in 1887. The introduction of pumping stations along the river promoted an expansion of farming and led ultimately to the development of irrigation areas (including the Murrumbidgee Irrigation Area). In 1915, the three Murray states – New South Wales, Victoria, and South Australia – signed the River Murray Agreement which proposed the construction of storage reservoirs in the river's headwaters as well as at Lake Victoria near the South Australian border. Along the intervening stretch of the river a series of locks and weirs were built. 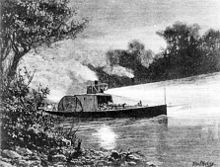 These were originally proposed to support navigation even in times of low water, but riverborne transport was already declining due to improved highway and railway systems. Four large reservoirs were built along the Murray. In addition to Lake Victoria (completed late 1920s), these are Lake Hume near Albury–Wodonga (completed 1936), Lake Mulwala at Yarrawonga (completed 1939), and Lake Dartmouth, which is actually on the Mitta Mitta River upstream of Lake Hume (completed 1979). The Murray also receives water from the complex dam and pipeline system of the Snowy Mountains Scheme. An additional reservoir was proposed in the 1960s at Chowilla Dam which was to have been built in South Australia and would have flooded land mostly in Victoria and New South Wales. This reservoir was cancelled in favour of building Dartmouth Dam due to costs and concerns relating to increased salinity. From 1935 to 1940 a series of barrages was built near the Murray Mouth to stop seawater egress into the lower part of the river during low flow periods. They are the Goolwa Barrage, located at 632 metres (2,073 ft), Mundoo Channel Barrage at 800 metres (2,600 ft), Boundary Creek Barrage at 243 metres (797 ft), Ewe Island Barrage at 853 metres (2,799 ft), and Tauwitchere Barrage at 3.6 kilometres (2.2 mi). Dead and dying River Red Gums on the lower Murray near Berri, South Australia. These dams inverted the patterns of the river's natural flow from the original winter-spring flood and summer-autumn dry to the present low level through winter and higher during summer. These changes ensured the availability of water for irrigation and made the Murray Valley Australia's most productive agricultural region, but have seriously disrupted the life cycles of many ecosystems both inside and outside the river, and the irrigation has led to dryland salinity that now threatens the agricultural industries. In 2006, the state government of South Australia revealed its plan to investigate the construction of the controversial Wellington Weir. Lock 1 was completed near Blanchetown in 1922. Torrumbarry weir downstream of Echuca began operating in December 1923. Of the numerous locks that were proposed, only thirteen were completed; Locks 1 to 11 on the stretch downstream of Mildura, Lock 15 at Euston and Lock 26 at Torrumbarry. Construction of the remaining weirs purely for navigation purposes was abandoned in 1934. The last lock to be completed was Lock 15, in 1937. 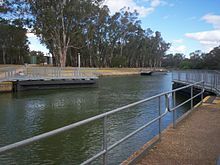 Lock 11, just downstream of Mildura, creates a 100-kilometre (62 mi) long lock pool which aided irrigation pumping from Mildura and Red Cliffs. 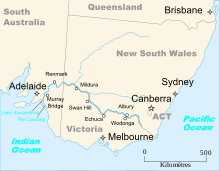 ^ In South Australia, the rendition "River Murray" is the more common, as is "River Darling" and "River Torrens". ^ "People of the Murray River - Aboriginal communities". 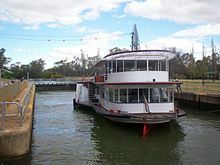 www.murrayriver.com.au. ^ "(Australia's) Longest Rivers". Geoscience Australia. 10 December 2013. Retrieved 10 December 2013. ^ a b "The Murray Mouth". Murray-Darling Basin Commission. Archived from the original on 29 August 2007. Retrieved 20 September 2007. ^ "(Australia's) Longest river by State and Territory". Geoscience Australia. Retrieved 11 April 2016. ^ Australian Bureau of Statistics (31 October 2012). "2011 Community Profiles: Albury – Wodonga". 2011 Census of Population and Housing. ^ "Murray River's natural history dates back 130 million years". The Murray River is an ancient river, even by the time scale of geologists. Its origins date back about 130 million years ago. Discover Murray River. Retrieved 12 December 2013. ^ "History of the Murray River". Dicover Murray River. Retrieved 7 March 2019. ^ "People of the Murray River - Aboriginal communities". Dicover Murray River. Retrieved 7 March 2019. ^ "The LateMr. J. C. Hawker. An Interesting Career". Adelaide: The Register. 16 May 1901. ^ "British Adventurer Dave Cornthwaite completes Australian Expedition along Murray River". Australian traveller. 8 January 2010. Retrieved 30 January 2018. ^ "Irrigation". www.mdba.gov.au. Retrieved 15 August 2017. ^ a b "Weirs and locks". Murray-Darling Basin Authority. Retrieved 17 June 2017. Mackay, Norman; Eastburn, David, eds. (1990). The Murray. Canberra: Murray-Darling Basin Commission. ISBN 1-875209-05-0.